So it’s a few days after the 2016 presidential elections, and, it appears, at least from my Facebook feed and from my friends, that the world is ending. And that reminds me that there was a time when the world didn’t even exist. When all in the universe was utter blackness, a chaotic vacuum of the deepest silence imaginable. In other words, things could be worse. But from within this chaotic darkness emerged all of a sudden probably the most famous words that we’ve ever heard: “let there be light.” The first chapters of the Torah, in the Book of Genesis, is where we start to see the three big themes of the Hebrew Bible play out: the story of the Jewish People, the relationship between humanity and God, and our relationship to each other. From the six days of creation, to Shabbat, to Adam and Eve and the Garden of Eden, we begin laying out interpretations of these ancient stories to form our earliest values and traditions. WHO WROTE GENESIS AND WHY? The Book of Genesis is a combination of at least two, and probably three, different authors. We know this because Genesis sometimes tells the same story twice, but relates different details and emphasizes different conclusions. Why? 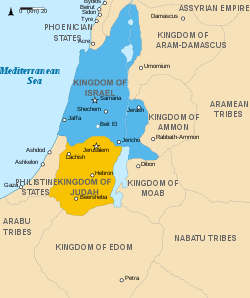 One theory: Genesis is the product of two separate centers of power in ancient Canaan — the kingdoms of Israel in the north, and Judah in the South. Each kingdom would have written its own version of Judaism’s origins in order to bolster their historical legitimacy and ideologically outlook. But later on, at the time that Genesis was written, they needed to put their two stories together in order to unify the people around one compelling narrative. It’s a reminder, I think, that we are talking about human documents that were written for a purpose. These books and stories are meant to be understood symbolically, not literally. The first phrase of the Bible is “when God began to create heaven and earth”. Unlike other creation myths in ancient societies, God in the Bible does not have a creation story. God is just there — Jews assume that God is pre-existing and omnipotent and invisible, not existing in any one place or the other in physical form. This notion of a single omnipotent God whom the Jewish people would come to have a relationship with, sets the stage for the entire rest of the Bible, and all subsequent Jewish traditions. And we haven’t even finished the sentence yet! This is also one of the major reasons why Jewish tradition is very accommodating to scientific explanations for our physical world. If we changed the phrase to “when the universe began to create heaven and earth,” we would probably all think of the Big Bang. So there really isn’t a good reason, for instance, why accepting the notion of the Big Bang would invalidate the notion of God creating everything in the first 6 days. It’s fairly compatible. Day 1: God creates heaven and earth by declaring “Let there be light,” and separating the light from the dark to create day and night. Day 2: God separates waters below from waters above, creating the sky. Day 3: God creates the land, called Earth, and names the waters created on day two “seas”, and creates plants. Day 4: God creates the sun, the moon, and the stars, to provide light during the day and at night. Which is weird, because didn’t God already create light on the first day to separate day and night? So already there’s a contradiction. It’s explained away by a midrash — a story that the Jewish sages made up to explain something in the Bible. In this case, the midrash explains that the light from the first day was a kind of divine light that illuminated the universe which was in the process of being created. But because humans screwed everything up, God has withheld that divine light until the coming of the next world. So in the meantime, we’ll have to make use of the sun, moon, and stars. Day 5: The fifth day God creates fish, birds, sea monsters, and living things that crawl. Presumably spiders. Day 6: The creation of land animals and humans. And here’s where things start to get interesting. Now, you know two different versions of the creation of humans, but you probably think they are from the same story. But they’re not. From the first chapter of Genesis, we learn two main things about the creation of humans. The first is that people are created in the image of God. The second thing to know is that man and woman are created together at the exact same time. That story is told twice — in one version, Eve is created after Adam using his rib. But in the other, chapter one, verse twenty-seven, God created them at the same time, and they’re not named. I think it’s high time we emphasize this first chapter of Genesis, in which men and women are created at the same time, and both in the image of God. If we can pull down at least one column of religious justification for the subordination of women to men, we can further weaken support for that glass ceiling. According to Jewish tradition, God didn’t use Adam’s rib to create woman in order to make her dependent on Adam. God used the rib as a reminder to Adam that an essential piece of him was forever bound up in his partner, and therefore that loyalty to each other, that essential connection to each other, was what would distinguish humans from the other creatures.